Electric vehicles can drastically reduce emissions from passenger vehicles. This is clear for us, who are active in the EV field, but maybe not so clear for the general public in Canada. 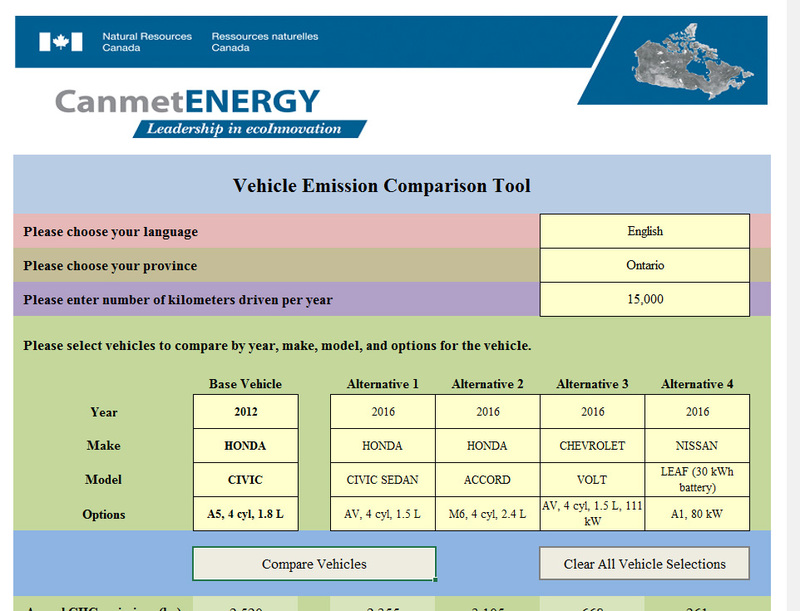 Natural Resources Canada has therefore developed a simple, easy-to-use software, bilingual tool for Canadians to compare the emissions of their next vehicle purchase to those of their current vehicle. This software tool is shared freely with EV stakeholders in Canada in hope to maximize its effect in educating the public on the emission reduction potential of electric vehicles and contribute to an accelerated penetration of EVs into the light-duty vehicle fleet. The tool uses vehicle performance data from NRCan’s Office of Energy Efficiency (including MAY 2016 vehicles) and GHG emission data for provincial electricity generation from Environment & Climate Change Canada.